Home > Replacement Filters → Carbon Filters → Aries Scale Reduction Cartridge 10"
Aries Scale Reduction Cartridge 10"
Aries Scale Reduction Cartridge 10" is a standard 2.5" x 10" filter that uses Carbon(GAC) and Phosphate combination to effectively improve taste and odor by removing chlorine while reducing hardness, calcium, and scale buildup. The Granular Activated Carbon/Phosphate mix dramatically improves the quality of drinking water as well as protecting metal parts from corrosion when used in industrial applications. The remarkable cleaning and absorptive properties of Activated Carbon or Coconut Shell Carbon makes it an effective water purifier. Carbon removes chlorine, sediment and Volatile Organic Compounds(VOCs). Phosphate, on the other hand, is responsible in reducing scale buildup and corrosion on metal parts. 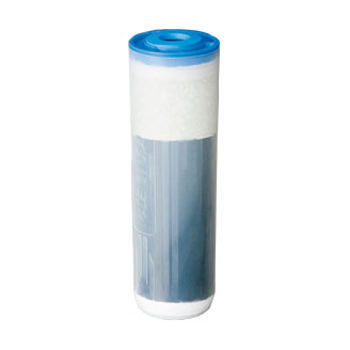 Aries FilterWorks Anti-Scale Filter Cartridge AF-10-3305 fits most standard 10" residential and industrial water filter housings. This mixed bed deionizing filter can be used in slow flow applications with high levels of hardness and where that is undesirable, such as in California and Arizona. 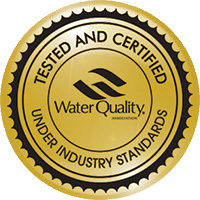 It is also best applied in commercial use, residential use and pre-treatment to Reverse Osmosis. Manufactured using high quality ResinTech media and a strict quality control over all aspects of cartridge production, this premium product is the best to have at the most competitive cost. Premium ResinTech resins Coconut Shell GAC and slow melt Polyphosphate. Ideal for pharmaceutical, semi-conductor, medical, and industrial applications. Oversized cartridge for maximum Media Fill. Fits standard residential and insutrial style housings. Prop 65 compliant for drinking water applications. Quality produced and Made in the USA. *Cartridge capacities and flow rates are estimated. Actual performance will vary. Contact factory for additional capacity information.